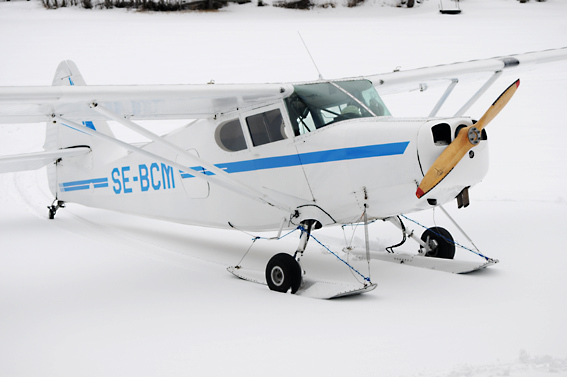 Image and information about Stinson 108 aircraft equipped as a ski plane. The owner tells me he normaly flies without the fairings at the landing gear. Take of distance on hard surface with the owner (220 pound) - and fully loaded with fuel - is just 360 feet. (nill wind and 55 F.) Which is very impressive when you consider the airplane has a 54 inch pitch cruise propeller. Belive it or not, the speed has now increased (!) with additional 2-4 kt (crusing at 2,200 rpm) and the need for trim is less than before! In take off position you lift the tail from the ground/ice as fast as possible, normaly it takes just some twenty yards before the tail is rising. Forgot to tell you that I use DOUBLE front safety wires (5/32) in this installation, and 5/32 springs in the front, instead of shock cords. The springs (and one of the two safety wires) are mounted at the engine lower engine mount fittings. 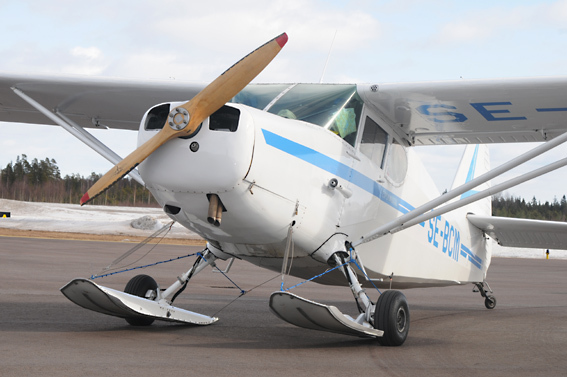 The second safety cable is attached to the Stinson ski-fitting, bolted to the landning gear. By the way, leaning to best economy at 2.200 rpm (then speeding 90 kt) the engine burn just about 7,4 gallon/hour. Weight and balance is with the Federal 3000 skis is of course different: The payload for this beauty is normaly 897 pound. The weight of the Federal 3000 skis, with pump, oil etc are 132 pound - so with the hydraulic skis the payload decreased to 765 pound, witch still isnt bad, I think. Due to balance problems (in worst case) I always have to load at least 60 pound in the cargo appartment. I always carry a lot of extra emergency equipment and fuel (duty of flying in mountain terrain) so its realy not a problem for me. Added 03/25/10.